ISG has worked with The Football Association to deliver a world first by deploying Virtual Replacement Technology on the LED perimeter signage to target different worldwide broadcast audiences in their recent international match against Costa Rica. 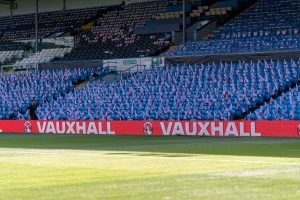 The deployment during England’s FIFA World Cup warm-up game played at Elland Road stadium in Leeds last week was the first time anywhere in the world that this LED-driven technology has been in full live, commercial use in international football. Through the use of this virtual technology the advertising seen on the LED perimeter boards in the broadcast coverage in the targeted territories was completely different to the messaging on show to fans in the stadium and across ITV’s domestic coverage and the World Feed. ISG secured the rights from The FA to deliver the virtual perimeter advertising for the game and commercialised two concurrent virtual feeds, one being delivered to the Americas and the other to Asia, Australasia and parts of Europe. “We delivered two virtual feeds,” explained ISG joint CEO Tony Ragan. “One feed carried advertising specifically focusing on fans in Costa Rica and the Americas region and the other carried adverts of a broader international appeal as a result of teaming up with our sales partner Sportseen,” he added. “We are technology agnostic,” continued Ragan. “We look at what is the best solution for a specific rights holder and match the technology to that requirement and found Supponor’s digital billboard replacement to be the best technology for this fixture”.